Fear is a complicated thing. It can prevent us from trying new things, meeting new people, and reaching our full potential. I was recently asked what I love most about my lifestyle and my answer was opportunity. Opportunity is what I love most because it’s something that is presented to all of us in different ways but what we choose to do with it is up to us. Sometimes we don’t say yes to new opportunities out of fear and that fear can keeps us in somewhat of a self formed prison. Sounds dramatic I know, but think about it this way, when we don’t take chances because of fear we continue to live a stagnant life, not moving forward and not reaching our full potential. Our fear creates a prison around us that prevents us from excelling. Learning to address and tolerate our fear is one of the most powerful things we can do for ourselves. The sun setting from the Emmons Glacier on Mount Rainier. Some fear helps us separate safe situations from dangerous ones and this is not to be ignored. Listen to your gut but always ask questions. For example, you come down from a climb early because you’re afraid of heights or you are in a backcountry ski area where you just saw signs of a potential avalanche. These are two different types of fear. One is overcoming an obstacle (fear of heights) and the other is rational fear that could have very serious consequence (getting caught in an avalanche). I recently overcame a big fear and accomplished a goal that had been on Brad and I's bucket list since moving to the PNW - climbing Mount Rainier. 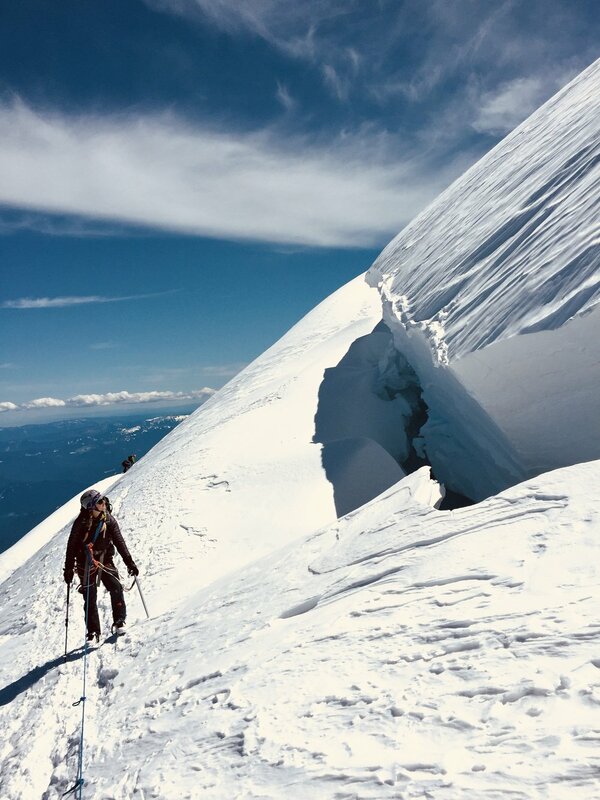 Climbing Rainier took months of preparation and came with all kinds of fear and self doubt, some rational and some not. I had moments of fear on the mountain when I was afraid of falling or questioned my ability to ski over 6,000 vertical feet but I persevered. I looked that fear straight and the eye and questioned it, tried to understand it, where it came from and if it was valid. Glaciers are dangerous, not doubt, but our skills were solid and I needed to trust that. When I addressed the fear head on I was able to let it go. It was ok that it was there but it was not going to control me or dictate my climbing. Next time you feel fear lingering, instead of ignoring it, trying to hide from it, or feeding into it, acknowledge it and try to identify what is behind it. Identifying the fear and understanding why it has come up is the first step in eliminating it and saying yes to those new opportunities. Stay tuned on my instagram for a full trip report of our Rainier climb on the Backountry.com Explore blog.